AnADAMA2 is the next generation of AnADAMA (Another Automated Data Analysis Management Application). AnADAMA is a tool to create reproducible workflows and execute them efficiently. AnADAMA operates in a make-like manner using targets and dependencies of teach task to allow for parallelization. In cases where a workflow is modified or input files change, only those tasks impacted by the changes will be rerun. Tasks can be run locally or in a grid computing environment to increase efficiency. AnADAMA2 includes meta-schedulers for SLURM and SGE grids. Tasks that are specified to run on the grid will be submitted and monitored. If a task exceeds its time or memory allotment it will be resubmitted with double the time or memory (based on which resource needs to be increased) at most three times. Benchmarking information of time, memory, and cores will be recorded for each task run on the grid. Essential information from all tasks is recorded, using the default logger and command line reporters, to ensure reproducibility. The information logged includes the command line options provided to the workflow, the function or command executed for each task, versions of tracked executables, and any output (stdout or stderr) from a task. Information reported on the command line includes status for each task (ie which task is ready, started, or running) along with an overall status of percent and total tasks complete for the workflow. A auto-doc feature allows for workflows to generate documentation automatically to further ensure reproducibility by capturing the latest essential workflow information. AnADAMA2 was architected to be modular allowing users to customize the application by subclassing the base grid meta-schedulers, reporters, and tracked objects (ie files, executables, etc). AnADAMA2 is easy to install. Python 2.7+ is required. All other basic dependencies will be installed when installing AnADAMA2. The workflow documentation feature uses Pweave which will automatically be installed for you when installing AnADAMA2 and Pandoc. For workflows that use the documentation feature, matplotlib (version2+ required), Pandoc (<version2 required), and LaTeX will need to be installed manually. If your document includes hclust2 heatmaps, hclust2 will also need to be installed. Add the option --user to the install command if you do not have root permissions. AnADAMA2 does not install an executable that you would run from the command line. Instead, you define your workflows as a Python script; anadama2 is a module you import and use to describe your workflow. Before we get started with a basic workflow, there are a couple important definitions to review. A unit of work in the workflow. A task has at least one action, zero or more targets, and zero or more dependencies. An item that is created or modified by the task (ie like writing to a file). All targets must exist after a task is run (they might not exist before the task is run). An item that is required to run the task (ie input file or variable string). All dependencies of a task must exist before the task can be run. Targets and dependencies can be of different formats. See the section on "Types of Tracked Items" for all of the different types. Tasks are run by executing all of its actions after all of its dependencies exist. After a task is run, it's marked as successful if no Python exceptions were raised, no shell commands had a non-zero exit status, and all of the targets were created. A basic workflow script can be found in the examples folder in the source repository named exe_check.py. The script exe_check.py gets a list of the global executables and also the local executables (those for the user running the script). It then checks to see if there are any global executables that are also installed locally. This script shows how to specify dependencies and targets in the commands directly. Lines 4-6 of the example script show targets with the format [t:file] and dependencies with the format [d:file]. The first line imports AnADAMA2 and the third line creates an instance of the Workflow class removing the command line options input and output as they are not used for this workflow. These two lines are required for every AnADAMA2 workflow. Lines 4-6 add tasks to the workflow and line 7 tells AnADAMA2 to execute the tasks. All AnADAMA2 workflows have a command line interface that includes a few default arguments. The default arguments include an input folder, an output folder, and the number of tasks to run in parallel. See the section "Run an Intermediate Workflow" for information on how to add custom options. For a full list of options, run your workflow script with the "--help" option. The number of tasks to execute in parallel locally. pattern and build all targets that match. -d, --dry-run         Print tasks to be run but don't execute their actions. pattern and exclude all targets that match. end task by task number or task name. children of successful or skipped tasks are executed. are available to execute have completed or failed. -g GRID, --grid=GRID  Run gridable tasks on this grid type. times to not execute multiple tasks. Collect inputs from this directory. -n, --skip-nothing    Skip no tasks, even if you could; run it all. The number of tasks to submit to the grid in parallel. Run gridable tasks on this partition. The local date/time for the message is printed first. The progress of the workflow is represented as three numbers. The first number is the number of tasks that finished running. The second number is the total number of tasks in the workflow. The last number is the percent completion for the workflow. The status of the task is printed. Tasks can be skipped or started and they could complete or fail. There are a total of six different status messages. Ready: All dependencies for the task are available. The task is in the queue waiting for computational resources. For example, if there are 10 tasks that are ready and 10 jobs were specified to run at one time, all ready tasks will immediately start running. If there are more ready tasks then jobs specified, these tasks will wait until other jobs have finished running before starting. Started: The task started running locally or is about to submit a job to the grid depending on if a task is gridable and if the command line options specified a grid to be used. Completed: The task finished running without error. Failed: The task stopped running and an error was reported. Skipped: The task has been skipped. It does not need to be run because the targets of the task exist and have newer timestamps than the dependencies. GridJob: The task has been submitted to the grid. This status indicates incremental status messages are included at the end of the message about the status of the grid job. The task number is included to identify the task associated with the status message. A description for the task is included which by default is the task name. If a task does not have a name the description is the first task action. If this action is a command the description is the executable name. If this action is a function the description is the function name. The description is limited to keep the status line to at most 79 characters. The total number of characters required are based on the total number of tasks, since more tasks require more padding for the formatting of the progress section and task number parts of this message to keep all sections in their respective columns. If a description is truncated, it will be followed with an ellipsis (ie "Very Long Task Description is Reduced ..."). If a grid is selected, additional status information is printed including job submission and states. This additional column in some cases can increase the total line length to more than 79 characters. 2016-10-28 09:07:38,613       LoggerReporter  task_completed  INFO: task 3, `Task(name="sed 's|. *Address: \\(.*[0-9]\\)<. *|\\1|' my_ip.txt > ip.txt", actions=[<function actually_sh at 0x7f32ff082410>], depends=[<anadama2.tracked.TrackedFile object at 0x7f32ff07dfd0>, <anadama2.tracked.TrackedVariable object at 0x7f32ff07df90>, <anadama2.tracked.TrackedExecutable object at 0x7f32ff092050>], targets=[<anadama2.tracked.TrackedFile object at 0x7f32ff092190>], task_no=3)' completed successfully. 2016-10-28 09:07:38,613       LoggerReporter  task_started    INFO: task 5, `whois $(cat ip.txt) > whois.txt' started. 2 parents: [3, 4]. 0 children: . 2016-10-28 09:07:38,875       LoggerReporter  task_completed  INFO: task 5, `Task(name='whois $(cat ip.txt) > whois.txt', actions=[<function actually_sh at 0x7f32ff082488>], depends=[<anadama2.tracked.TrackedFile object at 0x7f32ff092190>, <anadama2.tracked.TrackedVariable object at 0x7f32ff07df10>, <anadama2.tracked.TrackedExecutable object at 0x7f32ff0921d0>], targets=[<anadama2.tracked.TrackedFile object at 0x7f32ff092390>], task_no=5)' completed successfully. 2016-10-28 09:07:38,875       LoggerReporter  finished        INFO: AnADAMA run finished. Tasks in each workflow can have one or more targets. A target is an item, usually a file, that is created or modified by a task. With AnADAMA2, you can select specific targets for each of your runs. This is useful in that it allows you to only run a portion of your workflow. Targets for each run are selected through the command line interface. The options that allow you to specify a target or set of targets can be shown by running your workflow with the help option. See the prior section for the full list. Running the example workflow with the target option would only create the "global_exe.txt" file. Targets that do not include a full path are expected to be located relative to your current working directory. If a target is in a different folder, provide the full path to the target. Running the example workflow with the expanded target option would only create the "global_exe.txt" and the "local_exe.txt" files. For targets with patterns, place the target in quotes so the pattern is not evaluated by the shell. $ python check_exe.py --target "*l_exe.txt"
AnADAMA2 will always place at least two items in the output folder. The output folder by default is the directory of your workflow script. If in your workflow, you remove the output folder the database will be written to your home directory and the log will be written to your current working directory. All workflows without output folders will share the same database. Currently it is not possible to run two workflows at once that share the same database. AnADAMA2 stores a target and dependencies tracking database in the output folder for each run. This includes information on all of the items AnADAMA2 tracks from the workflow. You shouldn't need to look at this file, but you can remove it to erase all history of past runs. The log file will contain information on all of the tasks run including standard out and standard error from every command line task. It will also include the values of all workflow arguments. Example AnADAMA2 workflow scripts can be found in the examples folder of the source download. Three of these example scripts are described below. The script simple.py downloads a file and then runs two linux commands sed and whois. This script shows how to specify dependencies and targets in the commands directly. The script has_a_function.py shows how to add a task which is a function to a workflow. This script will download a file, decompress the file, and then remove the trailing tabs in the file. The script kvcontainer.py shows how to use a container as a dependency. This container allows you to track a set of strings without having them overlap with other strings of the same name in another workflow. Examples of running AnADAMA2 in Jupyter Notebooks are included in the examples folder. Jupyter nbviewer can be used to render the notebooks online. The first notebook shows a simple example on how to download files. To see the notebook rendered with nbviewer visit AnADAMA2_download_files_example.ipynb. The second notebook illustrates a more complex example of processing shotgun sequencing data. This example requires additional dependencies be installed prior to running. It also requires input files and database files to be downloaded. To see the notebook rendered with nbviewer visit AnADAMA2_shotgun_workflow_example.ipynb. The do function allows you to specify targets and dependencies in the task command with the special formatting surrounding the full paths to specific files. These tasks have binaries and also the full commands tracked. The do function can be replaced with the add_task function to provide you with additional types of targets and dependencies. Taking the example workflow and replacing lines 4-6 with add_task functions instead of do functions you can see how the syntax changes. An intermediate workflow can contain five sections. Some of these sections are optional to include based on your workflow. The example workflow below has one task which is to run MetaPhlAn2 on a set of fastq input files. Section 1 is required. In this section the anadama2 workflow is imported and a workflow instance is created. This section needs to be included in all AnADAMA2 workflows basic, intermediate, or advanced. Line 3 adds the version and description information to the workflow. This is optional. These values will be printed when using the command line --version and --help options. Section 2 is optional. In this section custom arguments are added to the command line options. Next the workflow parses the options. This command is not required as by default the workflow will parse the arguments from the command line when they are needed by the workflow. Because the options are parsed on demand, it is not possible to add custom arguments later on in the workflow, like after running tasks, because the command line arguments are needed before tasks can be created and run. Section 3 is optional. These two helper functions allow you to easily get input and output files. You do not need to include section 2 in you workflow to use these functions. The first function will return all of the input files with the extension provided in the input folder. The input folder can be provided by the user on the command line. The default location of the input folder is the current working directory. The output files function will only return the name of the output files providing the basenames, extensions, and tags. These two functions differ in that the input files function will search the input folder for files with the selected properties (ie. extension) while the output files function will only return full path names. The output files function will not search the output folder as the files to be named likely do not exist yet and will be created by the tasks. The output folder is a required option which can be set in the workflow or can be provided on the command line by the user. Section 4 is required. In all workflows, tasks will be added. These tasks can be added with do, add_task, add_task_group, do_gridable, add_task_gridable, and add_task_group_gridable functions. The gridable functions allow for tasks to be run on a grid. See the grid computing section for more information. Tasks can have targets and dependencies. Targets are usually files that are created by the task and dependencies are usually files that are required as input for the task. Optionally parameters can be provided to the add_task function with their names substituted into the command if written in the square bracket format. For example, the task in the example workflow replaces [extension] in the command with the variable provided so it evaluated as args.input_extension which is the value of the input file extension, either the default or the value provided by the user on the command line. Section 5 is required. In all workflows, there must be at least one call to the go function. This is the function that will start the tasks running. If this function is not included, none of the tasks will be run. The intermediate workflow shown below will run a set of fastq files with KneadData. This script is named kneaddata_workflow.py and can be found in the examples folder. Line 3 adds version information and a description to the workflow. Line 5 adds a custom option so that the user can provide the location of the kneaddata database on the command line with --kneaddata_db <folder>. Line 6 adds another custom option allowing the user to set the input file extensions. Line 8 parses the arguments from the command line and returns their values. Line 10 returns a list of all of the files in the input folder with the extension provided. Line 11 returns the matched output files replacing the input folder location with the output folder and the input extension with that expected from kneaddata. Line 13 adds a group of tasks. One task is added for each of the input and matched output files. Line 15 executes the tasks. A document can be added to the workflow to allow for automatic generation of reports including text, tables, plots, and heatmaps based on data generated from the workflow tasks. The reports can be formatted as any Pandoc output type (ie pdf, html, html5, json, docx, etc). The report format requested is indicated by the extension of the report file name. The default document feature uses Pweave and Pandoc. Alternatively, a custom documentation class can be provided to your workflow instance if you would like to customize the documentation feature. To add a document to your workflow, first create a Pweave template. It can be formatted as any Pweave input type (ie pandoc markdown, script, tex, or rst). For more information on these formats, see the Pweave documentation. The template file extension indicates the file format with .py for python and .mdw for Pandoc markdown. The templates can use the AnADAMA2 document to add features like tables, plots, and heatmaps. For more examples, see the bioBakery Workflows document templates. 19 #' run through [HUMAnN2](http://huttenhower.sph.harvard.edu/humann2). 25 #' there were <% print(len(pathways)) %> pathways identified. Line 1: Start a python section indicating that the code should not be written to the document. If echo is set to true, the text will appear in the document. Lines 3 and 4: Import the default AnADAMA2 document and create an instance. Line 6: Get the variables for the document. The variables are the "vars" argument provided to the "add_document" function in the workflow. The variables for this template are "title", "project", "introduction_text", and "file_pathabundance_unstratified". Line 8: Add a title using the document variable "title". Line 9: Add the project name to the report. Line 10 Add the current date. Line 12: Add the introduction section header. Line 13: Add the introduction text. Line 19: Add text including a link to the HUMAnN2 landing page. Line 21: Start a section of python which will not be echoed to the document. Line 22: Read the pathway abundance file returning sample names, pathway names, and the data matrix. Lines 24-25: Compute the total number of samples and pathways and add them to the generated text. Next create a workflow that includes a document. A workflow that creates a document can be short with just code to create a workflow instance, add a document, and then run go to start the workflow. 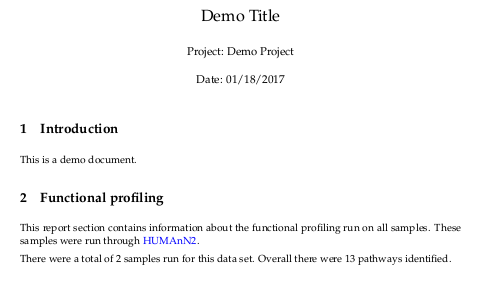 This example workflow will run all of the fastq.gz files in the input folder through humann2, then merge the pathway abundance output files, and split the file to create a stratified and unstratified pathway abundance file with data for all samples. Lines 13-17: Add a group of tasks to run HUMAnN2 on each fastq.gz input file. Lines 19-23: Add a task to join the pathway abundance tables for each sample. Lines 25-26: Add a task to split the pathway abundance table into a stratified and unstratified table. Lines 31-38: Add a document to the workflow. In this example the template file is named "template.py". It is a python script with pandoc markdown. Depends and targets are set for documents just like for tasks since generating a document is a task. The variables provided to the document task in lines 35-38 are passed to the document template. Document variables can be any python object that is pickleable. The document file generated is named "functional_profiling_document.pdf" and is located in the output folder. Changing the document file name to "functional_profiling_document.html" would generate a html report. To add a table of contents to your report, add table_of_contents=True to the add_document function. Finally run the workflow with python. For this example, if the workflow is saved as a file named "example_doc_workflow.py", it would be run as follows. The document created will look like the following image (with the date replaced with the date the workflow was run). An archive can be added to a workflow to allow for automated generation of a packaged file containing products from various steps in the workflow. The user specifies which items are included in the archive and the type of archive. Archives are useful for packaging documents plus their corresponding figures and data files. To add an archive to your workflow, call the add_archive workflow function with the path to the archive you would like to create along with the folders/files you would like to archive. Here is the document workflow example from the prior section with an archive added. Line 31: This line is modified to capture the add document task in a variable. Lines 40-43: These are the new lines added to add the archive. The target is the path to the archive that will be created. It is named the same as the output folder provided by the user on the command line. The list of dependencies are those items to include in the archive. This example includes the full output folder in the archive. Dependencies can also be tasks which must run before the archive is to be created. These task dependencies will determine when the archive will be rerun. For example whenever a new document is created the archive task will be rerun. The "zip" target extension sets the archive type. An optional parameter is set to indicate the workflow log should not be included in the archive. Writing a workflow to run in a grid computing environment is very similar to writing a workflow to run on your own local machine. We can make just a few changes to modify the example "exe_check.py" workflow to run all tasks on the grid. We just need to specify which tasks we would like to run on the grid replacing do with do_gridable. These tasks by default will run locally. If the command line option --grid-run is provided the gridable tasks will be run on the grid partition provided. In lines 4-6 we also add three arguments to specify memory (in MB), the number of cores, and the time in minutes that each task should be allowed in the queue. Another option is to submit only some of the tasks to the grid computing environment. This can be done by changing the do_gridable to do. We can modify our example to only run the global executable check on the grid. Similarly if we were using add_task instead of do, add_task_gridable will run the task on the grid while add_task will always run the task locally. If you are running with sun grid engine instead of slurm, you do not need to modify your workflow. The software will identify the grid engine installed and run on the grid available. Alternatively, when running your workflow provide the options --grid <slurm/sge> and --grid-partition <general> on the command line. The time and memory requests for each task can be an integer or an equation. Time is always specified in minutes and memory is specified in MB. Equations can include the same formatting as task commands with replacement for dependency and core variables. For example time="10 / [cores]" would request times based on the number of cores for that specific task (ie. 10 minutes for 1 core and 5 minutes for 2 cores). Equations can also use the size of the files that the task depends on. For example, time="10 * [cores] * file_size('[depends]')" could be used to set the time for a task. The file_size function is an AnADAMA2 helper function that returns the size of a file in GB. This equation will be evaluated for the time right before the task is to be started. This allows for equations to use the size of files that might not exist when the workflow starts but will exist before a task is set to start running. All of the tasks in the example are currently commands. They are strings that would be run on the command line. Instead of passing commands as a task you can provide functions. Here is the example after replacing line 5 with a function that writes a file with the list of the global executables. A decorator is a function that takes another function as input and extends the behavior of the input function. Instead of providing a function as input to a task you can use the add_task to decorate your input function. Taking the example workflow which already included a function in the prior section and using the decorator method moves line 10 to line 4, right before the function get_global_exe. Targets and dependencies, both of which are tracked items, can be one of six types. They are provided to the function add_task. By default all targets and dependencies provided as strings to add_task are file dependencies. Depending on the size of the file these could be large file dependencies for which the checksums are not tracked to save time. We can specify the types of dependences as file and huge files in the add task function. In line 4 we specify a file dependency and in line 6 we specify a huge file dependency. In line 2 we import the AnADAMA2 dependency functions. Directories can be specified in the same way as file dependencies. In line 4 of the example, a directory dependency is added. In line 2 we import the AnADAMA2 dependency function. Executables can be specified in the same way as file and directory dependencies. Adding line 2 and then including an executable dependency in line 4 of the example adds the "ls" dependency. Function dependencies are specified similar to the other dependencies. In the example workflow, modified to include the function, we add the function itself as a dependency. You can also have tasks that depend on variables or arguments to your task actions. In our example, say we only want the first N global executables. We would create a container with our variable name and then provide it as one of the task dependencies. A set of files can also be a dependency. For example, if we only wanted to list all global executables that started with the letter "a", we could add them all as a dependency that is a set of files. Tasks that depend on items that are not created by other tasks have pre-existing dependencies. By default AnADAMA2 will automatically try to register the pre-existing dependencies. If the dependency does not exist at runtime, an error will be issued. For example, if the file "global_exe.txt" did not exist and the following workflow was run an error will be issued. There is a function that can register these dependencies. To use this function we would add line four to the prior workflow example. The API is automatically generated and will reflect the latest codebase.